You will find our quick, safe delivery methods to be one of the most competitive in the industry! Mattresses will fully recover with 24-48 hours after they are opened. As every mattress is made to order you can trust that your order will be quickly processed and safely shipped within 2-3 business days. We can ship products anywhere in the United States using our reliable shipping method (FedEx). When you place an order we will estimate delivery rates based upon the size of box being shipped and quantity ordered. We also offer discounted shipping for large quantity orders based upon shipping in bulk. Our shipping charges are determined by the size of box and distance being shipped. Some products must be shipped in a (over sized) full box which adds roughly $20 per box, which will be included in the shipping and handling. Some products cannot be shipped to international destinations so please submit a message to us from the form at left or Contact Page if you would like to discuss international ordering options. You can trust that your order will be quickly processed and safely delivered. We ship our handmade mattresses throughout the United States using our reliable shipping method (FedEx ground), with a tracking option available. Orders typically leave the warehouse within 2-3 business days. When placing your order, delivery rates are estimated based upon size and quantity ordered. Shipping charges are determined by the size of box needed, the weight, as well as the distance being shipped. Trying to save our customers money, some products must be shipped in an over sized box in place of shipping multiple boxes, or reduced in size for better shipping. Discounted shipping is offered with orders placed in large quantities. Some products cannot be shipped to international destinations. Orders shipping outside the Continental U.S. are subject to additional shipping, duty and tax charges. If you have further shipping questions, please submit a message on the Contact Us page, send an email to sales@summercampmattress.com or give us a call at 1-800-448-6163. Order online, or simply give us a call! We’re happy to take care of all of your camp and other mattress needs. ICC Regulations require that claims for damaged merchandise must be made with the carrier within fifteen (15) days of receipt of merchandise. DO NOT ACCEPT DAMAGED SHIPMENTS UNLESS SUCH DAMAGES ARE NOTED ON THE DELIVERY RECEIPT AT THE TIME OF PICKUP. 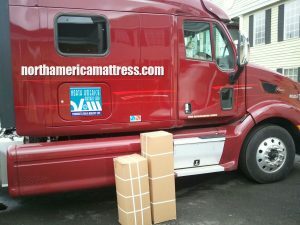 Upon prompt notification, North America Mattress Corporation/SummerCampMattress.com will file a freight claim with the appropriate carrier for damages incurred. Claims will be limited in amount to actual replacement cost. In the event that this information is not received by North America Mattress Corporation/SummerCampMattress.com within the fifteen (15) day period following the delivery of the merchandise, or the damage was not noted on the delivery receipt at the time of receipt, the customer will be responsible for payment of the original invoice in full. Claims for any short shipment must be made within ten (10) days of invoice.